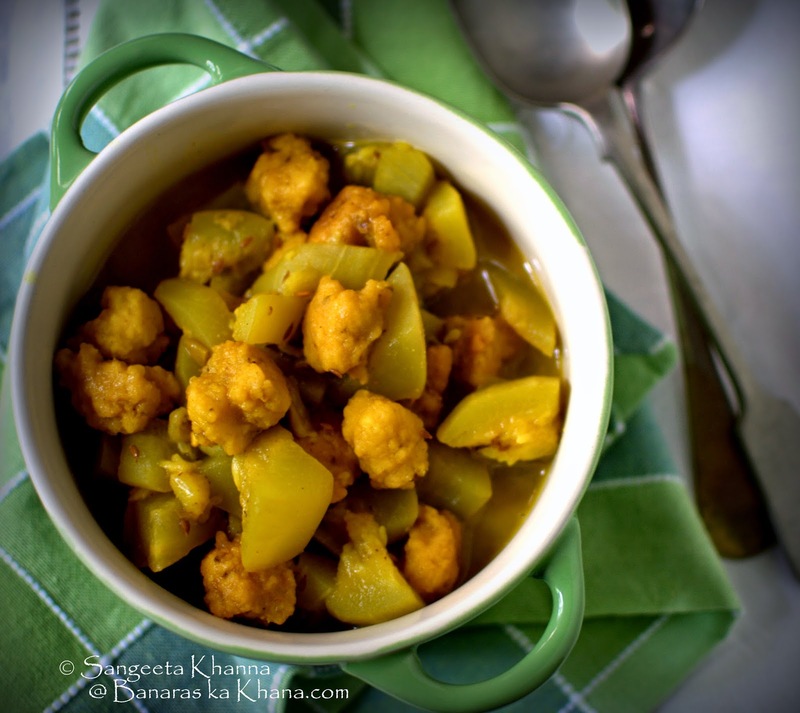 Mungodi wali lauki is another simple curry that can be cooked for everyday meals. I have been posting a lot of everyday curry recipes lately, and that is because I have been getting loads of requests for simple home style curries that one eats everyday. And to tell you the truth, I have been getting reminded of so many favourites I have tasted in my life so far. Some of them I learnt from my mother, some from my grandmother, some from friends but this one I learnt from my MIL. She used to cook mungodi wali lauki quite often but she would always use dry store bought mungodis for convenience. Later I tasted a mungodi subzi (without lauki) cooked by a friend and tried adding those freshly made mungodis to the plain lauki subzi and the result made me so happy. I keep going back to this subzi because I eat lauki a lot and I need variation every day. 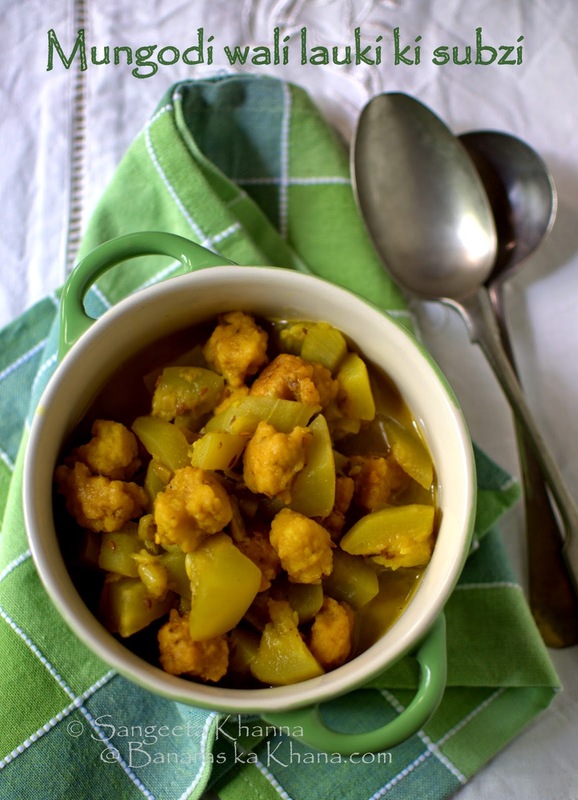 There will be more and more lauki recipes on this blog very soon, now that I have been posting every day curries with a new zest.This mungodi wali lauki is a jain recipe because no onion or garlic is used. You can fry the mung daal fritters in a large batch and keep them frozen to be used again to make a quick mungodi wali lauki or a mungodi wal kadhi too. Soak a cup of mung daal in enough water for 4 hours. Drain and make a paste along with 1 tsp cumin seeds. Do not add water while making a paste. Heat oil for deep frying. Drop small spoonfuls of mung paste into hot oil and fry on medium heat so the mungodis cook thoroughly. Drain on kitchen tissue and keep aside. Recipe of mungodi wali lauki..
Heat oil or ghee in a pan or pressure cooker. Note that the freshly fired mungodis behave well in an open pan but the frozen ones would need to be pressure cooked or cooked for a bit longer if cooking in a pan. Tip in cumin seeds and ginger and green chillies and quickly add the turmeric powder and cubed lauki. Toss and mix well. Cook for a couple of minutes tossing all the while. Now add the salt, the mungodis and a cup of water for each dozen of mungodis. They soak up a lot of water and get doubled in size. Cover and pressure cook till the first whistle blows. Let the cooker cool down on it's own and serve hot with or without a garnish of green coriander leaves. I can polish off this curry as it is. The mungodis make this subzi a filling meal. Note : These mungodis do not soak up oil while frying but you need to be careful to keep the mung paste thick and make the fritters uniformly smooth all over. Loose paste (batter) or uneven surface of the fritters allow them to soak up oil and make them heavy.